This week the Rotary Club of Caribou elected new officers for the 2016-2017 Rotary year which starts on July 1. Austin Bleess is the new Rotary Club President, and Steve Mazerolle is the President Elect. 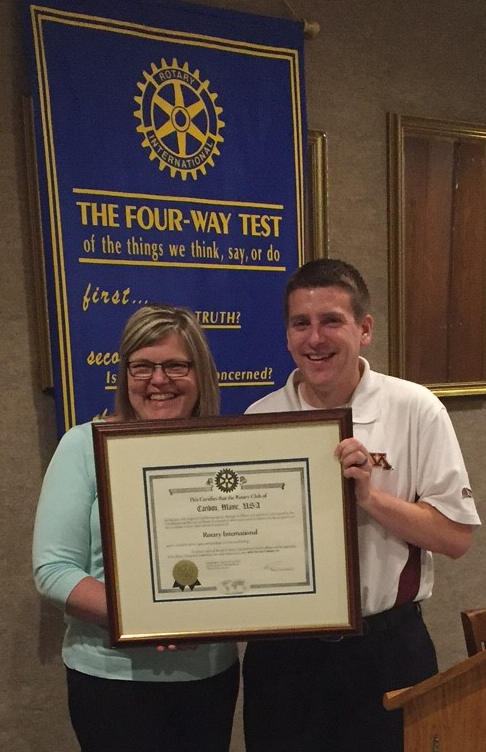 Outgoing President Malissa Dubie hands the Caribou Rotary Charter off to the incoming President Austin Bleess. Some of the projects that the Caribou Rotary Club completed this past year included donating money to the new playground equipment at the Hilltop School, new roofs on the dugouts at the Sincock Street ball field, and the annual bicycle helmet giveaway to third graders. Bleess said the Rotary Club is considering ways that they contribute to the new school project that is slated for Caribou. “As our Rotary Club has always been a strong supporter of the youth in Caribou, this project is a perfect match,” said Bleess. Bleess said the club is always accepting new members and if anyone is interested in learning more about the Caribou Rotary Club they can find more information online at www.caribourotary.org or by sending an email to caribourotary@gmail.com.